When I posted about justice earlier this year, I said that one of the points made to me was, if you want to work for justice, find ways to incorporate it into your current life. Justice feels like such a big issue, that big action is necessary. This isn’t possible for me right now, but small actions are. So, I’m celebrating the small actions. For me, this has meant incorporating Fair Trade products into my life when and where I can. Fair Trade means that the farmers and workers who contributed to providing a product were compensated appropriately for what they provided. It means their working conditions are safe, and environmentally sustainable processes are used. It prohibits child labor so that kids are in schools instead of fields or factories. 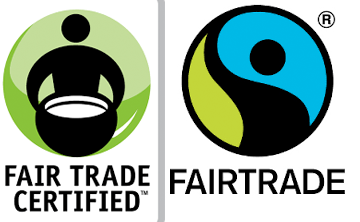 I now look for the Fair Trade logos when I’m at the grocery store, and when it comes to coffee and chocolate, I only buy Fair Trade products. When I started this in the spring, Target only had one option for Fair Trade coffee. The last time I checked, they had several – as did Publix. Even Wendy’s is now offering a Fair Trade green tea. So, it is amazing at how often you have the opportunity to support justice when you’re looking. 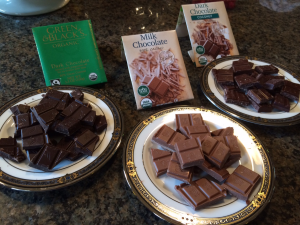 One of the most fun things I’ve done was have a Fair Trade chocolate tasting for my book club. And with just a little planning, I served a nearly 100% Fair Trade menu – including wine! Finally, if you act quickly, it isn’t too late to give out Fair Trade chocolate at Halloween. I ordered ours from Equal Exchange this past weekend. For me it is another small way I can help spread the word about the importance of justice in our world.